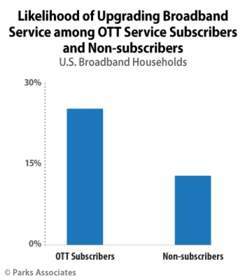 DALLAS, TX--(Marketwired - Dec 17, 2015) - Parks Associates announced research today reporting 25% of OTT video subscribers in U.S. broadband households plan to upgrade their broadband service in the next 12 months. Only 7% of consumers who watch video exclusively on television plan to upgrade their pay-TV service in the next 12 months, compared to 22% of consumers with above-average viewing on all platforms, including computers and mobile devices. Parks Associates and industry executives from AirTies Wireless Networks, Comcast, Gracenote, Lynx Technology, Sling TV, and TiVo will examine the roles of multiscreen use and OTT consumption in driving service upgrades during CONNECTIONS™ Summit: IoT, Entertainment, and the Connected Consumer, January 6-7 at CES® 2016 in Las Vegas. The session "Cloud-based CE and Virtualization" will examine changes in CPE product design and deployment as the OTT, broadcast, and pay-TV worlds converge in a virtual space. "Evolving usage habits around multiscreen viewing are shaping all aspects of the industry, including service delivery, content production, and the devices consumers use to access content," said Brett Sappington, Director of Research, Parks Associates. "Today, one-third of broadband households that own three or more connected devices state that they are likely to upgrade their broadband service in the next 12 months. These high-speed connections will enable improved experiences, encouraging consumers to spend even more time with connected entertainment."